As little as 13 percent of Europeans think the Soviet Army played the leading role in liberating Europe from Nazism during WW2, a recent poll targeting over 3,000 people in France, Germany and the UK reveals. The majority of respondents – 43 percent – said the US Army played the main role in liberating Europe. The survey, carried out from March 20 to April 9, 2015, was conducted by the British ICM Research agency for Sputnik News. Over 50 percent of Germans and over 61 percent of French citizens believe their ancestors were liberated by the Americans. Nearly fifty percent of Britons think British forces actually played the key role in ending the Second World War. Only 8 percent of respondents in France and 13 percent in Germany credited the Soviet Army for the victory. WW2 lasted from 1939 to 1945 and involved over 80 countries and regions. Up to 70 million people are believed to have lost their lives. However, the USSR suffered the biggest losses. At least 27 million Soviet citizens died during the war. Various estimates say the Soviet Red Army liberated nearly half of Europe's territory, which comprise 16 modern European countries. Allied forces liberated nine countries, while six more were freed by the Soviets and the Allies together, according to RIA Novosti’s count. The combined population of the territories, in which the Red Army beat back Hitler's forces, was about 120 million people. The Red Army also had to face the lion's share of Nazi forces on the Eastern Front - about five million soldiers. The vast majority of Hitler's military hardware was also concentrated in the East: 5,400 artillery pieces, 54,600 mortars and over 3,000 warplanes. Combined, it amounted to three-fourths of the heavy weapons at Hitler's disposal. By the end of the war, the Soviets had destroyed over 70 percent of the enemy’s forces. The Eastern Front was the widest, spanning four to six thousand kilometers, which is four times more than the North African, Italian and Western European frontlines combined. It was also the hottest, seeing 1,320 days of combat compared to North Africa's 309 and Italy's 49. 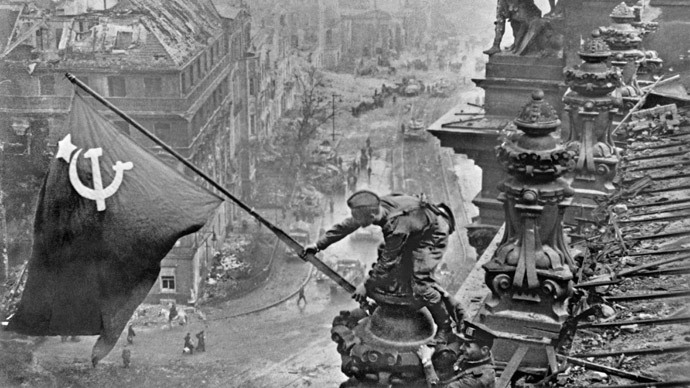 In mid-April 1945, the Soviet Army started the final offensive against the German capital, and on April 21, they entered Berlin. On April 27, the Red Army linked up with American troops at the River Elbe, cutting the German army in two. At the time, the commander of the US 12th Army Group, General Omar Bradley, praised the Soviet troops for their resolve in forcing the Germans out of Russia. On 2 May 1945, the Berlin garrison finally surrendered to the Soviet army. On 4 July 1945, US Independence Day, American troops officially took charge of their occupation sector in southwest Berlin. In January, 1945, the Soviet Army liberated the Nazis' biggest concentration camp at Auschwitz, in southwestern Poland, which was seen as a symbolic landmark. Earlier this year, in January, Polish foreign minister Grzegorz Schetyna bluntly dismissed Russia's role in the liberation of the Auschwitz death camp, claiming it was liberated by Ukrainians. “Maybe it’s better to say … the First Ukrainian Front and Ukrainians liberated [Auschwitz], because Ukrainian soldiers were there, on that January day, and they opened the gates of the camp and they liberated the camp,”Schetyna said in an interview with Polskie Radio.